When a nonprofit operates across borders, whether by making grants or directly operating programs, the interaction among legal requirements of two or more countries quickly becomes highly complex. How To Be A Global Nonprofit fills a need for legal and practical guidance for nonprofit organizations with international activities, and includes ten case studies to provide insights into the ways real organizations have dealt with various legal and practical issues. Along the way, it skillfully explores alternatives for advancing a nonprofit's mission across borders, while also looking at the legal and practical issues nonprofits encounter as they work internationally. Not long ago international philanthropy was the province of large organizations like the Red Cross, UNICEF, and Save the Children. This has radically changed. 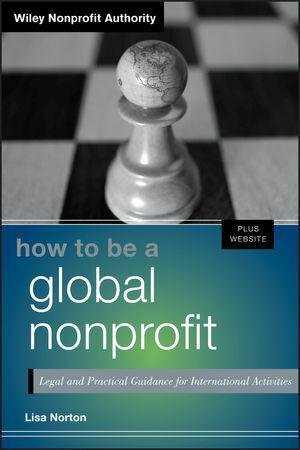 How to Be a Global Nonprofit thoroughly explores the legal and practical issues nonprofits encounter as they work internationally and the resources required to deal with them. LISA NORTON is an attorney whose law practice concentrates on serving a wide variety of nonprofit and tax-exempt organizations, helping organizations and donors to pursue their missions through proper structuring and legal compliance. Previously, she served as international tax counsel to several multinational corporations. She is a graduate of Harvard Law School and a member of the bar of the states of Washington, California, and New York. Lisa participates in various bar association committees and professional organizations that concentrate on nonprofit-related issues, and she has served on governing boards and committees of numerous charitable organizations and professional associations. Visit her website at www.lnortonlaw.com, and follow her on Twitter @GlobalNonprofit.